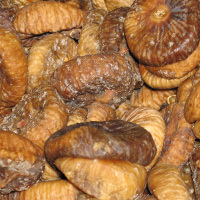 Dried figs is a type of dried fruit made from figs. It is produced in America but can be found in Shimane, Japan. It serves as a good source of dietary fiber, potassium, and calcium. Fiber in dried figs may help remedy constipation. It is said to go well with dairy products such as yogurt, blue cheese, and cream cheese. The calories in Dried Figs per 7g(1item) is 20 calories. Dried Figs is calculated to be 292Cal per 100 grams making 80Cal equivalent to 27.4g with 5.33g of mostly carbohydrates、0.28g of protein、0.04g of fat in 7g while being rich in vitamins and minerals such as Copper and Potassium.